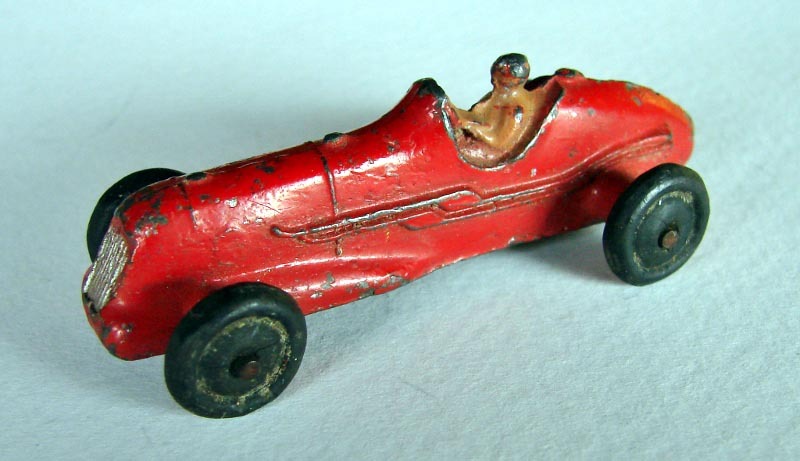 This little series of small motor cars seems to be largely overlooked by many while we are busy collecting other more glamorous models, such as the 30, 36, 38, or 39 series, or even the 23 series of racing cars. These are among the smallest Dinky's, averaging only slightly more than an inch long. The first three were introduced in 1936, and were 35a Saloon Car; 35b Racer; and 35c MG Sports Car, and these could be purchased separately or as Set #35 Small Motor Cars. The final car, 35d Austin 7 Car, was introduced in 1938, and was never included in the boxed set. It's companion was the military version, 152c, which differed only in the color. All of the pre-war issues came with white molded tires, which are actually smaller than those used on the various motorcycles, and the MG Sports Car and the Austin 7 pre-war versions also had some added silver detailing, such as the steering wheel and the representation of the folding windscreen and spare tire straps. Very early versions of the Racer did not have a driver and were available in a variety of finishes. The Austin 7 pre-war models had a wire windscreen that was dropped after the war, as well as a hole in the seat (for the optional driver in the 152c version). All of these were discontinued in 1941, and then re-issued in 1945, with black tires and the other changes mentioned above. The Saloon car and the MG Sports Car were made until 1952, and the Austin 7 was stopped in 1948. The Racer continued to be made until 1957, making it one of the longest lived Dinky models. My 1953 U.S. catalog does still mention all four of them, but the price list does not show the Austin 7. Thanks for the nice account, Terry. A rather isolated series this is, constructed in a different way, on dublo (c. 1:77) scale only, and rather crudely cast for that scale. 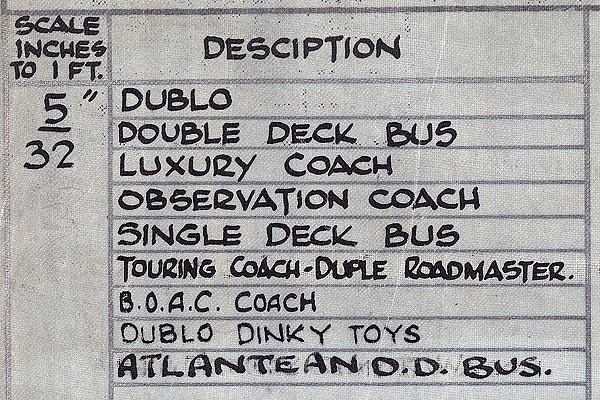 Like the later Dublo Dinky Toys it is a rather 'difficult' series: too few items to be really collectable in their own right, and hardly matching other Dinky Toys, except for the buses and coaches, which share the same scale as demontrated in the list detail below ('description' in header without 'r'). Indeed the pre-war items have some more charm and attractiveness because of their mostly white tyres and duo tone colour schemes. Jan--you are right in that it was a very small, and isolated little series, without much in common with the rest of the line. And the castings are quite crude, especially when compared even with the same era 30 and 36 series. Some of the colors are nice, I particularly like the MG Sports Car in Red...saw some photos of the other colors in GBofDT. I was just glad to be able to find the pre-war Austin 7 still with it's wire windscreen. In all my years of collecting, there are very few of those listed on eBay in the U.S., although I am sure they are all somewhat easier to find on the Continent. With a replica driver which I should replace by an authentic one some time. I always really liked these, but the blue saloon is still the only one I have. Scale wise they do sit perfectly with the bus, I didn't notice that before. My 35b/200 Racer / Midget Racer. A real dwarf compared with the giant stylish art deco racer my wife surprised me with today! Jan--Quite a contrast in size between those two racers! Those little Dinky's are cute, but so tiny...it is a wonder that any of them lasted...they seem so vulnerable and fragile. Was that gift from your wife to celebrate a birthday or anything we should cheer about? No, nothing special to celebrate. My wife just noticed my enthusiasm for the smooth, swift design of this model when passing a curiosity shop window in our dwelling-place. It is really heavy, entirely made of a very nice shiny quality metal. Next day the surprise parcel was waiting for me when coming home! My todays question is related to the 35b racer. I found a red model with brown driver and black wheels and after I put it on the scale it showed 25 grams, substantially more then ordinary 35b, which total around 15 grams. I guess its made from lead. Turning it around, I noticed that all the correct markings: MECCANO at the back, Made in England in the centre and DINKY TOYS up front are there, but ahead of DINKY TOYS there is a capital W, which I can not find on any other 35b. 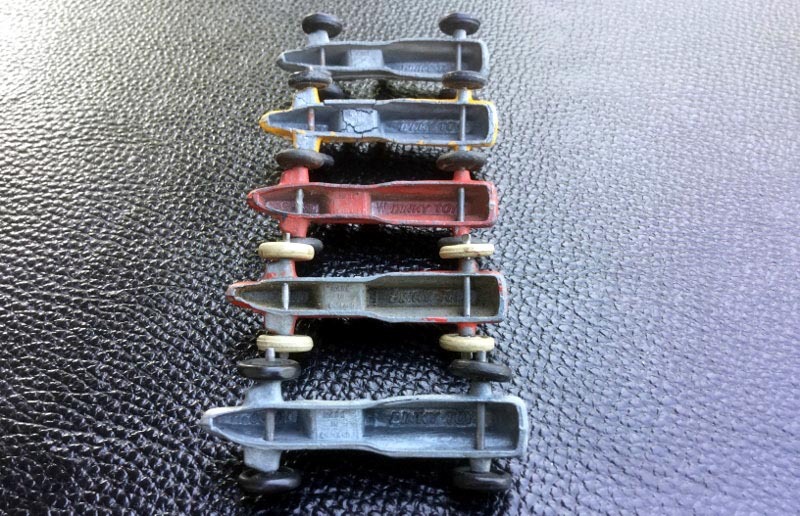 Did Dinky Toys made the 35b racer in lead too and when? And what is the meaning of this W? This seems to be an interesting find but it would be interesting to have a picture of the inside of the model. This seems to be something new in the Dinky Toys world. I can understand that the model is cast in lead or is it magnetic ? But the W ? Is this model pre-war ? has there been several dies because the W could not have been deleted ? I hope that somebody else can bring more info on this enigmatic model. What is going to come up next ? Had a look at my 35 racers. I did not find the W mentioned by Walter. The first 35b were produced without pilot head. I have found these only in silver. Inside is smooth before the word Dinky toys. Later models had a pilot and can be found in silver or red. I have also a red model with silver driver. Inside, later models have a cross + brfore the word Dinky toys. Weight of the models without pilot is 14 grams. There are many pre war models cast in lead so for the racer it is possible. Despite the small models can be found very often, the complete set is a rare one and very hard to find. Here is a picture of my set with the first racer in silver. The red model with the W is not magnetic, I have checked. And I tried to make a picture showing the undersides of all my 35b's. And finally a late silver post war issue, again with this vertical bar. Oh, I forgot to add another interesting aspect: the red lead model with the W is the only one colored inside out. All the others are colored only at the outside. Pre war model without driver. Pre war model with driver. It is very likely that this model is cast in lead. 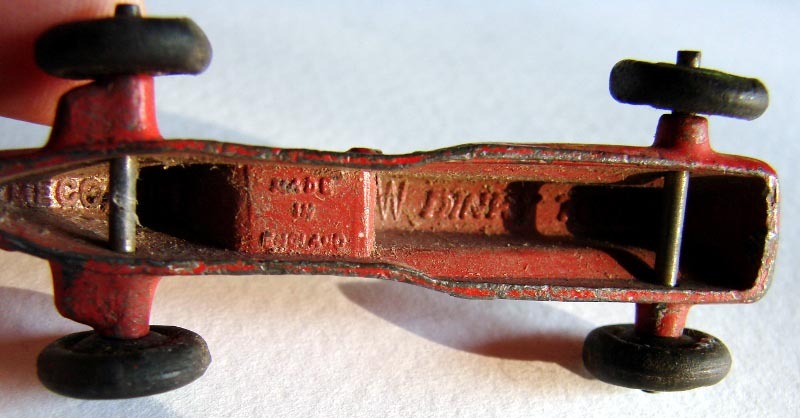 There is a W in front of the word DINKY and it is painted inside. There is a + sign in front of the word DINKY and the axles are crimped. Late issue. There is a + sign in front of the word DINKY. Late issue. There is no + sign in front of the word DINKY. All the pictures in this thread are by courtesy of Walter. If you have any more variations, please advise. I am still trying to establish the approx. date of production of the lead 35b Racer (see above). The factory drawing for this model is "Job No. 10123". Does anybody has a copy of this drawing? It could contain a note and date for such an alternative material used, like on the drawing for the 23e (221) Speed of the Wind (Job No. 10255A, dated 12.3.52), where such a remark can be found. Further, I would be grateful for all ideas and opinions on this subject . I am a little confused (more than usual, that is) as I have just purchased a small lot on ebay that includes what is apparently a 35d Austin in yellow, complete with wire windscreen. It also has a hole in the seat for a driver. I gather from the Richardsons' DT & MM that the pre-war civilian version did NOT have a hole for a driver, only the military 152c. However, the model shows no sign of repainting in yellow. It has the typical factory spray (or rather overspray) pattern underneath. Admittedly I have only the photos to go by, as I haven't yet received the lot, but does anyone have an example of a 35d WITH hole? Incidentally, included in the lot are two figures that came in the 150 Royal Tank Corps Personnel set. A 150c Private and a 150e NCO. These are acting as mechanics for the three 35b racers also included in the lot, which all appear to be post-war except that one has a silver grille where the others have red grilles. None of the models has either axles or tyres so no help in dating there. I look forward to posting photos when they arrive. Not very thrilling I know, but definitely cheap! John—Possibly you did not notice my initial post, above, on the 35 series, and the Austin 7. My blue Austin 7 is a pre-war version, and it does have the hole for the optional driver (which was supposed to be used for the military version). Since the civilian and military versions were identical, except for color, it made sense to have the hole already there. Hope this helps! Thanks for responding. I did read through the thread but Mike and Sue's statement on p.58 of DT & MM threw me." . . . First he quotes the Meccano catalogue decription 'The model is the same as No.152c except that it is finished in a range of different colours.' Mike then says " It is not quite the same as there is no hole in the seat for a driver but this is the only difference . . . ."
That confused me, hence my enquiry. Is there general agreement that ALL the 35d's had a hole in the seat? When I saw the one in the ebay lot I thought perhaps it was a 152c that had been repainted. Don't forget I'm elderly, confused, AND a noob!